Prep Day: Mix Cucumbers and Onions together and sprinkle with salt, mix well and let stand 2-3 hours. Rinse and drain well. Mix Vinegar and Sugar till sugar is dissolved. 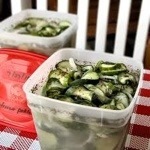 Put cucumbers and onions in freezer containers or freezer bags, pour vinegar/sugar mixture over cukes and onions (I only fill mine half full to leave room for expansion during freezing). Freeze 3 weeks before eating, the longer you let them sit the sweeter the pickles. Serve Day: Thaw in refrigerator or in cold water.